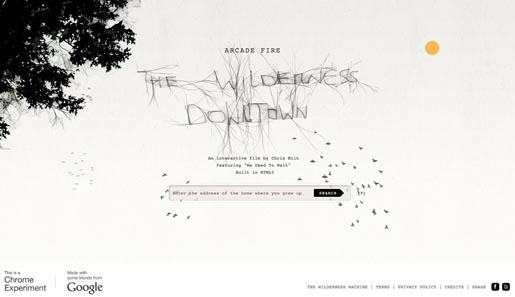 Canadian band Arcade Fire has collaborated with Google Creative Lab to produce The Wilderness Downtown, an interactive music video designed for Google Chrome browser. Visitors to the site are invited to enter the address where they grew up to allow the film to incorporate geopersonalised footage from Google Street View. The interactive film is designed to showcase the capabilities of HTML5, opening several windows at a time and allowing for user contribution. The Wildereness Downtown site presents a range of new online technologies centered on HTML5. HTML5 Canvas 3D engine renders a flocking bird simulation that reacts to the music and mouse. HTML5 audio plays music and keeps track of timecode. A sequence system controls and synchronises effects and windows to the timecode. HTML5 video plays film clips in custom sizes. Choreographed windows are triggered by the music and placed relative to screen size. Map tiles are rendered, zoomed, and rotated in a scripted 3D environment. Animated sprites are composited directly over maps and Street View. 3D sky dome is used to render Street View with scripted camera control. Procedural drawing tool allows the user to create velocity influenced tree branches. Generative typeface triggered by keypress, uses an SVG path reader and individual canvas compositing for each letter. Google Maps API is used to fetch dynamic routes to destination and check Street View content at points along the route. Street detection is used to dynamically composit animated trees in place over Street View. Arcade Fire is Win Butler, Régine Chassagne, Richard Reed Parry, William Butler, Tim Kingsbury, Sarah Neufeld and Jeremy Gara, with creative director Maureen Towey, band assistant Chantal Vaillancourt, Quest Management managers Scott Rodger and Jennifer George. Filming was shot by director Chris Milk via Radical Media with executive producers Jennifer Heath, Jon Kamen, Frank Scherma, technology director Aaron Koblin, producer Ari Palitz and director of photography Shawn Kim. Interactive production was done at B-Reel by creative director Ben Tricklebank, designer Evan Anthony, producer Nicole Muniz, development lead Eduard Prats Molner, front end development Jaime Sánchez and Guille López, back end development Eric Heaton. The Google Labs Tech Team were Aaron Koblin, George Brower, Michael Chang. Colorist was Dave Hussey at Company 3. Editor was Livio Sanchez at Beast Editorial with assistant editor Vic Barczyk and post producer Tonya Schabacker. Visual effects were produced at Gryphyn VFX by senior VFX artist Scott Bravo and assistant VFX artist Chris Caravella. 3D Production was done at B-Reel and Magoo 3d Studios by creative director Ben Tricklebank, producer Anders Törnquist, lead 3D artist Andreas Östlund, senior 3D artists Henrik Sandberg and Per Nyman, 3D artists Elias Dahlström, Fredrik Bjurhager and Thomas Checa. The Wilderness Machine was built at World Power Systems by Tom Jennings, Brett Doar and John Wee.